How to test Perl 6 modules and scripts? Writing Perl 6 code is fun. It is fun, but if you want to make sure your code runs even after upgrading to the next version of Rakudo, the best thing you can do is to test your code before upgrade and after upgrade. Doing that manually would be very time-consuming, error-prone and boring. Soon you'd stop doing it which means you would not know if your code still works as expected or not. The best thing you can do is to write automated tests. Writing tests is of course an additional investment. It takes time and thinking, but pays off quickly. Any changes you might want to make to your code. Any time you upgrade Rakudo or switch to one of the other implementations of Perl 6. You can just run your tests and immediately see if everything works as earlier or if something has changed. People familiar with the Test Anything Protocol (aka TAP) and the Test::Simple / Test::More world of Perl 5, will find this familiar too. Naturally the Perl 6 test framework is still a lot smaller than that of the Perl 5 world, but the basics are already there. If you are not familiar with it, the idea is that there are two main parts of the testing system. The test script that prints out a stream of numbered ok and not ok messages with some additional comments, and a "consumer" that can read and process this stream of strings. though hopefully you will have hundreds of test cases. (Also called assertions). As far as I know, there is no commonly used consumer implemented in Perl 6 so we are going to use the prove command that comes with the Perl 5 testing system. This will be especially useful when you have hundreds of test assertions. Most of them passing with ok, which are not that interesting to see, and one or a few failing. You would not want to see 250 lines of OK passing on the screen and needing to scroll back to see the one failure in the 3rd row. You'd want to see the concise report that shows the details of the failing test. The Perl 6 distributions follow a similar standard as the Perl 5 distributions. Inside the project directory you create a lib/ subdirectory and inside that you will find the Perl 6 modules. Next to it there is a t/ subdirectory with test scripts having .t extension. The modules are named in a similar fashion to what's happening on CPAN, so for example there is a module called Acme::Meow. There is no "standard" for the actual project names on Github, but I saw a few projects using a perl6- prefix in the name of the Github repository. Just as Tadzik did with the Perl 6 implementation of Acme::Meow. For more detailed information see the Perl 6 wiki on how to create and distribute Perl 6 Modules. Tests are simple Perl 6 script in the t/ directory with .t extension. As every Perl 6 script, it is recommended that the test scripts also start with a use v6; statement. This will avoid headaches when someone runs the test using perl 5 by mistake. The next statement is usually loading the Test module. This module comes with the Rakudo Perl 6 compiler and implements a few common ways to write assertions or test-units as I like to call them. 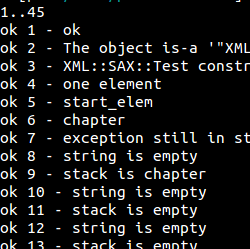 Once the test module is loaded you can declare you plan, how many assertions are you going to run, how many OK-s to expect. Having such plan can provide an extra safety net in case the test script finished too early. In our simple case we plan a single test case. After the plan we start the actual test code. We load the module we would like to test. My almost standard module is a (badly implemented) calculator called Math. It exports a single function called add. The &ok function is provided by the Test module. It is supposed to get a boolean value, or something that can be converted to a boolean value and it prints out either "OK" or "NOT OK" depending on that value. In addition it also increments an internal counter and prints the number. It is a a really simple function. The actual test case is using the &add function of the Math module and checks if add(1, 1) returns 2. As I said, that's a very simple case. The &ok function actually can get an additional parameter which is just a simple explanation of the test case. It can be very useful when trying to understand the problem. Apparently the add function does not handle more than 2 parameters correctly. As you can see the second assertion failed and got a comment about failing 1 out of 2 tests. While the &ok function is nice and simple, it does not provide a lot of context. It only tells you if the condition was True or False and the name of the test. There are a number of additional functions in the Test module that comes with Rakudo, which will provide better error messages in case of failure. The &is function of the Test module accepts 3 parameters. The actual value, the expected value and the name of the assertion. It will compare the actual value with the expected value and print OK if they are equal. This can help a lot in understanding what the real problem might be. There are a number of additional test functions such as nok, isnt, todo, skip, isa_ok, dies_ok, is_deeply and a few more, I'll mention in another article. This article was distributed to the subscribers of both the Perl 6 Tricks and Treats and the Test Automation Tips newsletters as this happended to be in both subject. You might want to subscribe to get notification when new articles are published. Perl 6 and the Rakudo compiler are not different from any other language and their compiler. If you want to make sure your code survives an upgrade, the best you can do is to write and run automatic tests. That can quickly point out the areas where your code might need changes to accommodate the changes made in the compiler. I hope this will help you get started in writing Perl 6 modules. This is of course not different from any other language, but it is more important in Perl 6 as it is still evolving much faster than other programming languages.